I am so glad I happened to discover this book! I truly enjoyed reading it, not least because it is so hard to find good Pagan Fiction set in modern (or near modern) times. The language was introspective and beautiful, the characters interesting, and the narrative filled with poignant details.This is definitely a work of Magical Realism more than Urban Fantasy. Don't expect a lot of overt and showy magick; you won't find any flashing lights and billowing smoke in this novel, but rather the subtler workings of supernatural power we see in real practice.That is because this is less a fun, light novel-- ice cream in book form, as I like to call it-- and more a work of literary fiction woven with Goddess-borne enchantment. This is a story with meat on its bones-- just as much about a self-discovery, broken marriages, life choices, and spiritual awakening as it is about finding the Goddess and realizing the magick in and around us all. It is a novel to provoke think, to uplift , to remind each of us of the divine nature in everything. Beyond that, it is also a sincerely good read: well written and enjoyable. I was actually surprised I'd never heard of it before!In fact, I have only two complaints about this book, one of which is very minor. Firstly, I will give you all fair warning: it becomes a little preachy about feminism in a couple of spots. (Seriously, I'm a moderate feminist and even I thought it grew just a bit heavy at times.) Please don't let that turn you off, however! The agenda does not outweigh the narrative, or even come close to doing so, and if you can simply take those few, brief lectures in stride, you will love this book! My only other complaint is that, near the end, a few of the lose ends seemed to be wrapped up a little too quickly. That issue is so minor, however, as to be a matter of opinion. Nonetheless, however this was all in all an excellent book! This is one of the most wonderful books I've encountered in ages. The main character is an Episcopalian Priest's wife, who "loves to make things." One day, using some homemade play-doh with her sons, she subconsciously fashions a figure very, very like the Venus of Willendorf. And she hasn't a clue what or who this represents, except that it brings her to tears.Over the course of the book, in a completely natural way, she comes to accept the Way of the Goddess, and the protection of a nearby Sacred Grove. There is absolutely nothing artificial about this book, and that's probably the reason I loved it so very, very much. Her eventual turning to paganism is completely organic, and by the time the Sacred Marriage is reenacted in the Sacred Grove, Esther (Astarte) has changed utterly. This book was written in 1993, and I noticed upon reading the Afterword, that the author thanks Starhawk, as well as others, for their help. I think that's one of the reasons the Divine Feminine comes across so very, very authentically in "Return of the Goddess." I dearly, dearly loved this book, and I intend to add it to my own permanent collection, to be read and re-read over and over again.For those friends of mine who haven't read this book, I urge you to do so. It's not dogma, it's completely organic. 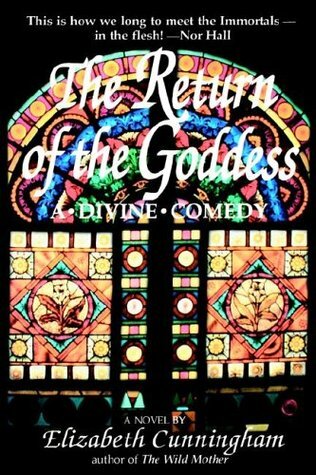 The Return of the Divine Feminine is one a lot of us have been waiting for a long time. I am a huge fan of Elizabeth Cunningham's Maeve Chronicles, so have been looking forward to a chance to read this earlier work of hers. With the recent 25th Anniversary release and availability on Kindle, I had a recent opportunity to dive in. Written with much heart and vulnerability, I enjoyed following the journey of Esther, the protagonist as she takes the plunge to explore her spirituality and in the process find herself. Honestly my favorite book by Elizabeth Cunningham. The story is a little predictable, but I still found it thoroughly enjoyable. Despite our circumstances not being exactly the same, I would say that I identified pretty strongly with the main character Esther, and I adored her nosy, mischievous, elderly neighbor Spencer. If I had to say there was a weak point to this book, I would pin it down to the character of Fergus. I felt like he was played a little too serious and as such I didn't enjoy his chapters as much as the other three protagonists. Although this book's story line became fairly predictable, I enjoyed the melding of the old ways with modern religion to develop the story. I enjoy reading authors with questioning minds. Part of the reason I read this right now was to get my own personal spirituality up and running again.I loved Cunningham's book "The Wild Mother." I was hoping "The Return of the Goddess" would give me that same feeling, but it fell a little short. Three stars is a little harsh, but I can't go the full four. A beautiful book about a woman learning the meaning of love, of learning to give up her Christian faith that makes no sense in the light of feminine power, and learning how to love agian. I especially like that her new lover is black. Stereotypes are broken and magic, passion and love bring new life to the dying land. Superb. I give this 4.5. Writers like James Patterson with their fast-paced style have spoiled me because I find myself skipping over the descriptive passages of this book. Not many authors write as beautifully as Cunningham, She has this writing style that's reminiscent of Marion Zimmer Bradley that make me wish I could write like that! Intriguing and well-written, I like the blend of themes. It covers a lot of ground, mainly the feminine principles at work in nature and religion. It's a tad on the formulaic/predictable side. Overall, a fun read and good intro to her work. Her Maeve series is a must-read. Modern story where clergyman's wife "discovers" the Goddess and more about herself and her marriage. Interesting story, but the characters needed more development, or maybe the characters' motivations needed to be clearer...I am not sure, but it's not *quite* right. Still, I enjoyed it. Not my kind of book....too surrealistic. I couldn't identify with the characters, so I didn't have the interest to keep reading. So beautiful! Both an elderly and young couple find love and sexuality through their spirituality. Cried at the end. Just thinking of this book makes me want to reread it. It defies classification as far as I'm concerned.